Provided photo Pictured left to right: Steven Sykes, Edison State professor of Manufacturing and Industrial Management; Dr. Tony Human, dean of Professional and Technical Programs; Ben Brigham, Nidec Minster talent development manager; and Chris Spradlin, Edison State provost. 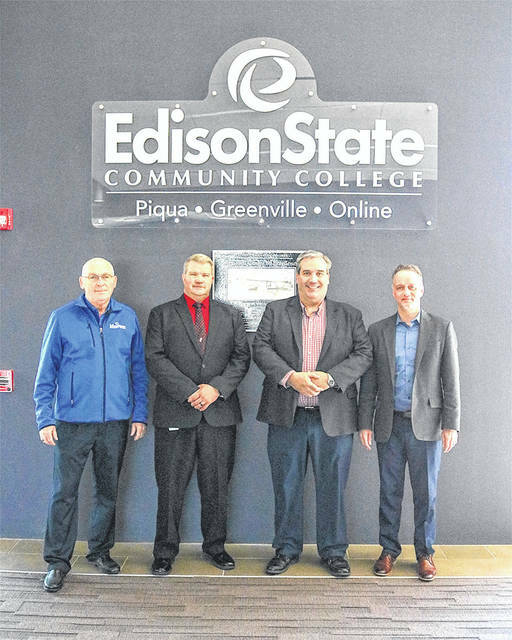 PIQUA — Edison State Community College and Nidec Press & Automation in Minster (Nidec Minster) have partnered to develop a pathway to facilitate the awarding of academic credits by Edison State for technical training conducted by Nidec Minster. The new pathway will create a seamless transition to the next step in education for Nidec Minster employees to obtain an Associate of Technical Study (ATS) degree with a major in one of three pathways; Mechanical Design, Electro-Mechanical Engineering Technology, or Advanced Manufacturing Systems. “The leaders at Edison State Community College worked extensively and creatively with Nidec Minster’s talent development team. Together, we created a true private-to-public pathway from our company-based apprenticeship programs to good-quality associate degrees at the college. These pathways will provide our employees with experiences and education needed to prepare them for advancement opportunities within our organization,” said Ben Brigham, talent development manager at Nidec Minster. Students who successfully completed in-house training courses at Nidec Minster may apply up to 29 credit hours toward the ATS degrees now offered at Edison State. The remaining balance of coursework required at Edison State may be completed online or in person in as little as one year. The Mechanical Design, Electro-Mechanical Engineering Technology, and Advanced Manufacturing Systems ATS degrees help employees to qualify for advancement within the management ranks of Nidec Minster. The Mechanical Design option provides students with basic mathematical, scientific, and engineering foundations necessary to mechanically design products for industrial, commercial, and personal applications. The Electro-Mechanical Engineering Technology option prepares students for the design, interface, installation, and troubleshooting of electro-mechanical systems as well as the skills to integrate electronics and electrical controls with mechanical systems in order to explore alternatives through the process of troubleshooting and problem-solving. The Advanced Manufacturing Systems program prepares students for milling and turning operations, CNC programming, welding, casting, metal-forming, materials technology, and heat-treating processes. “Developing the three ATS pathways with Nidec Minster provides an avenue for adult learners to gain the necessary education needed to compete in today’s job market,” said Dr. Tony Human, dean of Professional and Technical Programs. Edison State Community College is accredited by the Higher Learning Commission and the Mechanical Design, Electro-Mechanical Engineering Technology, and Advanced Manufacturing Systems ATS degrees are approved by the Higher Learning Commission and the Ohio Department of Higher Education. For more information about the degree pathways, call (937) 778-8600 to speak with a resource specialist. https://www.dailycall.com/wp-content/uploads/sites/30/2019/03/web1_EdisonState_NidecMinster_Partnership.jpgProvided photo Pictured left to right: Steven Sykes, Edison State professor of Manufacturing and Industrial Management; Dr. Tony Human, dean of Professional and Technical Programs; Ben Brigham, Nidec Minster talent development manager; and Chris Spradlin, Edison State provost.